When Martha got word that Jesus was coming, she went to meet him. But Mary stayed in the house. Martha said to Jesus, "Lord, if only you had been here, my brother would not have died. But even now I know that God will give you whatever you ask." Wow! Martha spoke words that actually were greater than her understanding and her faith. Jesus would and could give her whatever he asked from the Father. Sometimes we let the evil one deceive us into thinking that if somehow Jesus were here with us, it would be easier to believe and we could get many more fantastic things done. However, Jesus says just the opposite. Because he has gone to the Father, we can pray in his name, and he will ask the Father, and we will receive. 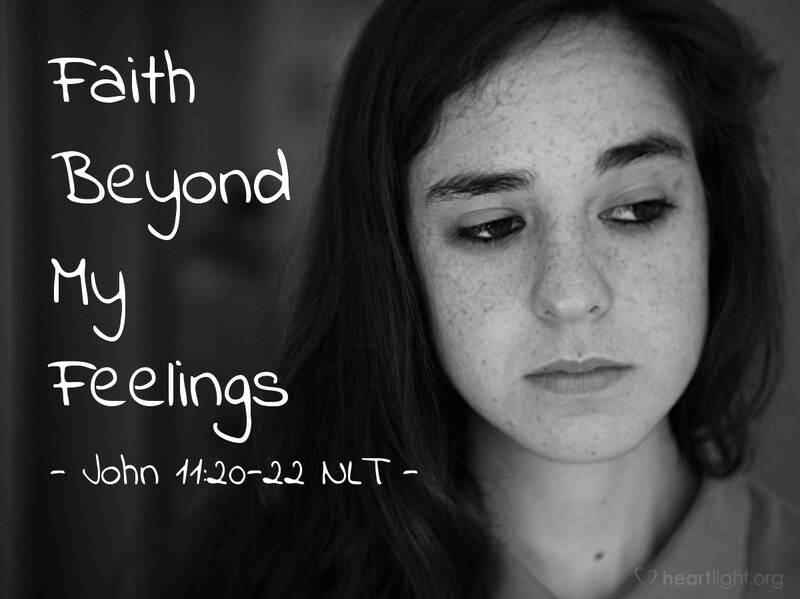 Let's ask for a faith that is greater than our feelings and our understanding, knowing that when we ask in Jesus' name, God hears our prayer and blesses us with heaven's best answer! Father, I do believe that you long to bless me as I pray to you in the name of Jesus, your Son and my Savior. I believe that you can do mighty things in response to my cries. So I pray that you act powerfully in the following situations that are upon my heart: ... In Jesus' mighty and authoritative name, I pray. Amen.